Narendra Modi alleged that Congress is "spreading illusionary fear" about the Constitution and vulnerability of Dalits and minorities. 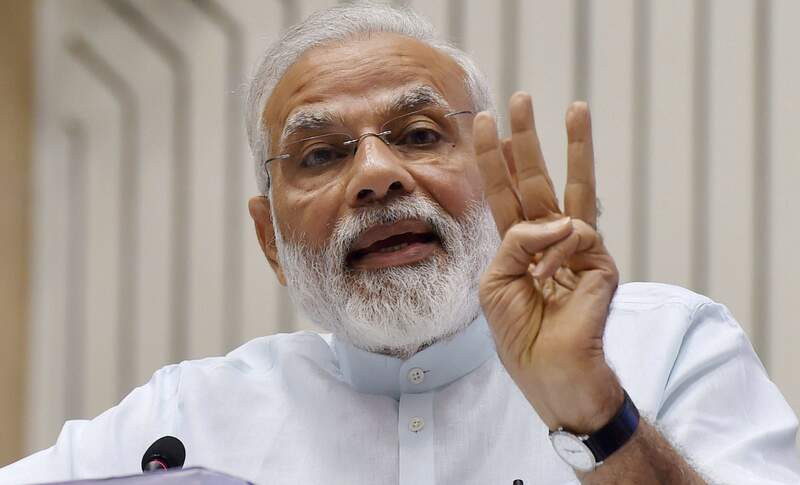 MUMBAI: Slamming Congress and the Gandhi family on the 43rd anniversary of the imposition of Emergency, Prime Minister Narendra Modi today said India was "turned into a jail for the selfish personal interests" of that family. Addressing a meeting organised by the BJP to mark the Emergency anniversary, Modi said the day needs to be observed to re-dedicate oneself to the protection of the Constitution and democracy. "Emergency is a black spot on the golden history of the nation. Observing black day today is not just to criticise the Congress for its sin of imposing Emergency but also to create an awareness for the protection of Constitution and democracy," Modi said. Lashing out at Congress for "spreading illusionary fear" about the Constitution, Dalits and minorities facing danger (in the BJP-led regime), Modi said Congress can never improve. "For the promotion of self-interest, they destroyed their own party," he said. "For selfish interests, Congress turned the country into a jail by imprisoning opposition leaders. For them, the country and democracy have no value. Instead of (Indira Gandhi) quitting as PM after the court verdict, Emergency was imposed. How can these people talk about safeguarding the Constitution," he said. "When Kishore Kumar ji refused to sing for them (Congress), his songs were not allowed to be played on the radio," Modi said. Modi accused the Congress of criticising EVMs and the functioning of the Election Commission after they were reduced to 44 seats from 400 in Lok Sabha. "They did not question the EVMs after the recent Karnataka elections," he added. He also criticised the Congress for moving an impeachment motion against the Supreme Court chief justice. "They (Gandhi family) never imagined that they can face corruption charges and be out on bail. Hence, the Congress decided to move impeachment motion against the chief justice," Modi said. Modi said his Government was committed to protecting Constitution and upholding democratic values. "The Constitution is not just a book but a means to fulfil aspirations and wishes of the common man," he said. Modi also paid tributes to Ramnath Goenka of the Indian Express, Kuldeep Nayar and the Statesman newspaper for "standing up" against Emergency. "Many of them were not our supporters either. Nayar is critical of us. But they fought for democracy," Modi said.